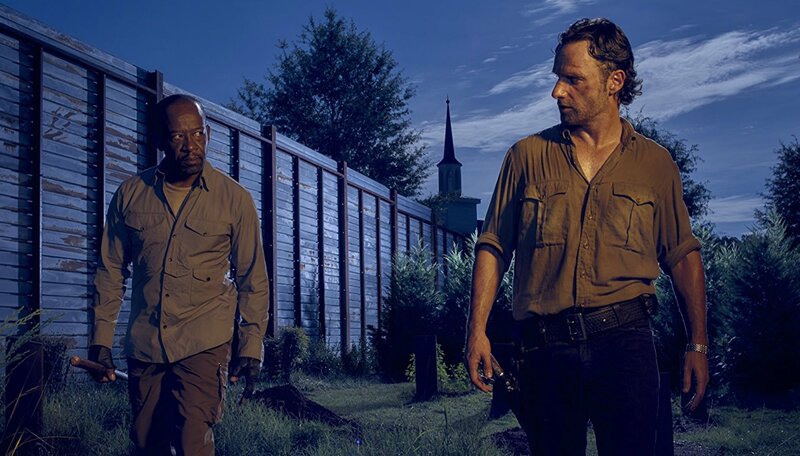 Fans of The Walking Dead are no doubt used to saying goodbye to their favorite characters. But that doesn’t make it any easier each time a fan-favorite character gets killed off by walkers (which, let’s face it, is often). And there may be another goodbye coming up. TWD‘s after-show talk show, The Talking Dead, just revealed which character may be next to leave, and this news is definitely going to break some hearts. According to showrunner Scott M. Gimple, Lennie James, who plays Morgan on the AMC series, is set to start showing up in the show’s prequel series, Fear the Walking Dead. The good news is that while he’s going to be extra busy for a while filming both shows, his exit from TWD isn’t coming right away. The time might be ripe for a change for Morgan. He’s been featured heavily on TWD since all the way back in the first season, so it’s not outside of the realm of possibility that James is looking for a new acting challenge — seven years is a long time to be on the same show. He hasn’t spoken publicly about the change yet, but that hasn’t stopped us from starting to speculate about how his character’s going to be killed off. Knowing TWD, it’ll be gruesome.